Piso and Beyond! : Ang Pinaka-Kuripot na Money Challenge! 7 Ang Pinaka-Kuripot na Money Challenge! 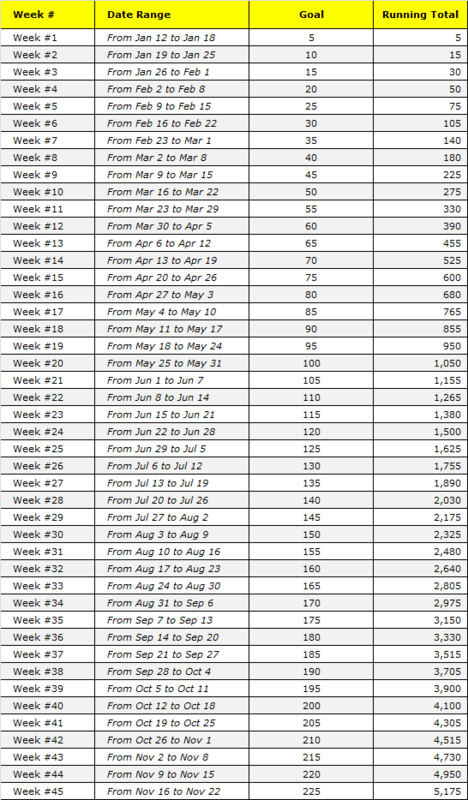 A few weeks ago, a friend sent me a link about a 52-week saving challenge that basically increments a specific base value every week. It was entitled the (Mas) Kuripot 52-week Money Challenge. And since we'd be using a lower base (Five Pesos!) 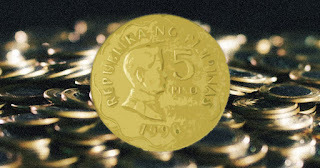 for this particular system, what better way to call it than Ang (Pinaka) Kuripot na Money Challenge! The goal? Open a Mutual Funds account at the end of the challenge! The process? 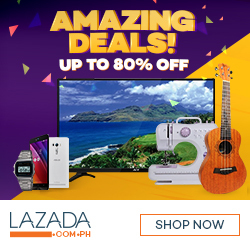 Save by increments of five pesos per week! How? 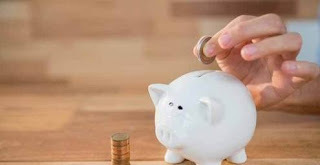 Read and you'll see for yourself..
More than the money (that you will be saving), is the lesson that following this system will teach you -- to make it a conscious habit to save and to stay committed to a process in order to achieve your goal. Bo Sanchez, in his book “8 Secrets of the Truly Rich”, defined what a Psychological Wallet is. Most of us are poor because psychologically, we don't want to be rich. Our minds have been programmed to resist money! Our money problems are actually mind problems because our mind has been conditioned to think that receiving a lot of money is shameful and is against the will of God, or because you are uncomfortable with money. So when you receive or save more than what you usually can, you try to get rid of the excess amount as soon as possible! So if you can't handle “small” money, how prepared are you to handle “big money”? To overcome this, you must increase your money comfort zone. You must learn to be comfortable to receive money first. One way is to imagine yourself receiving money or earning double of what you're earning now. Doing this regularly will get your mind to be comfortable with that thinking. And this Money Challenge will help you do that because it will increase the size of your money comfort zone one week at a time! At the end of the year, your mind (and yourself) can now easily save at least between 200 pesos a week or 1,000 pesos in a month. And it all begins with five pesos! Obviously, such system or challenge will teach you how to handle your finances more wisely because you have a target every week! What's even better is that you both have short-term and long-term goal with this challenge! Your short-term goal is to save a specific amount each week, while your long-term goal is to open a Mutual Funds account at the end of the challenge! 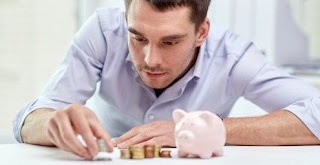 Financially speaking, saving alone will not suffice. Hence, the ultimate goal of saving should be investing the proceeds. However, working on a long-term goal could be a tough task, especially since not being able to hit it means telling yourself a failure. That's why this challenge will make you commit to a process of saving, one week at a time, instead of just focusing on the finish line. And that commitment will bring you closer to your goal, week after week! And it's the SMART thing to do! If you borrow from your savings, and re-pay them later on the succeeding weeks, welcome to the rat race! This is what most people do -- borrow money so they can spend money they haven't earned yet! Friend, leave your savings alone for now. If you plan to skip saving on April because, “Hey!, It's my birthday, I need to treat my friends to a lavish 500-peso-budget-party! I Only Live Once, right?” Yes, and so was time used to save for the money (and the money spent for that matter). Party your face! People love to make exemptions to the rule that they make for themselves. Isn't that genius? Friend, leave your savings alone for now, seriously. If you're a student, the challenging months could be March, April, May and November since these months are long breaks (i.e. no allowance). But instead of seeing them as challenges, use these months to earn some decent money to pay for your weekly obligation to save! Do some freelance works, such as manning stores, doing on-line jobs, selling pastries or services that you're good at. Why is it only a 45-week challenge? It's simple. The month of December or better known as the “spending month”, will test your acquired habit. Plus, isn't it a cool Christmas gift to yourself if you're able to open a Mutual Funds account out of your renewed sense of saving habit? By the way, opening a Mutual Funds account would only cost you 5,000 pesos. So the excess 175 pesos there is actually for some nice cup of Frappuccino. Spoil yourself a little this time. Tap your shoulders. You just passed the challenge! Remember that the goal of this scheme is to teach you how to save regularly without losing your sight on the target! Patience is a virtue. Some people would rather save bigger amounts on the early weeks, only to not be able to complete it. Why? Because their minds were not yet trained to save and budget religiously enough for them to sustain the habit. Can you pass the 45-Week Money Challenge? Receive cool updates like this when you subscribe to PisoandBeyond! This is a ridiculously awesome article! keep it up!! Your best post thus far! awesome post! i love this!! bkit ganyan? tumataas din ba ang sweldo mo linggo-linggo? Ang Pinaka-Kuripot na Money Challenge!